The Toledo Mud Hens are once again offering a fun and exciting opportunity for organizations to raise money during games at Fifth Third Field. 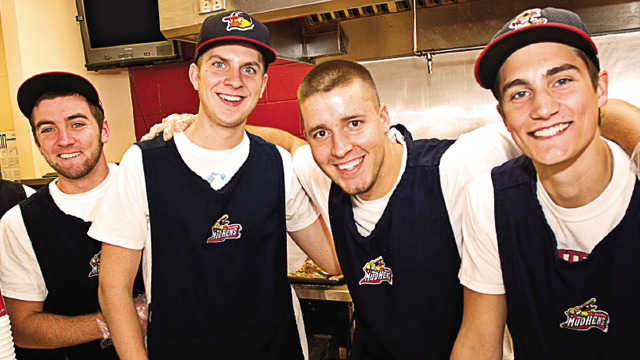 We are putting out a call for groups with friendly, hard-working volunteers to work the concessions stands and portable food and beverage carts during the 2015 season. The Mud Hens are eager to partner with organizations wanting to share in our success and earn some additional funds for their cause. A group will be given the tools needed to be successful, such as training, supervision and a percentage of the sales. Each year, contributions to local non-profit organizations taking part in our fundraising program total more than $140,000. Volunteers must be at least 16 years old, and they must be at least 21 years old in order to sell or serve alcohol. Click for all the details on group fundraising opportunities. Questions? Contact Corey Pleasant at 419-725-4396 or email at cpleasant@mudhens.com.